Persistence Market Research (PMR) analyzes the mosquito repellent Market in its new publication titled “Mosquito Repellent Market: Global Industry Analysis 2013 – 2017 and Forecast 2018 – 2026”. This global study on mosquito repellent provides data for 2017 along with the forecast for the period 2018 – 2026. The main objective of this global mosquito repellent report is to identify the dynamics of the market and provide recent updates and insights that affect the various segments of the global mosquito repellent market. 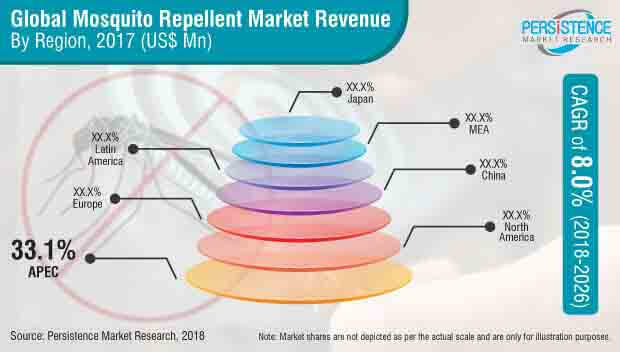 To provide a better understanding of the mosquito repellent market, the report also includes the analysis of global drivers, restraints and trends, which influence the current market scenario and will define the future status of the global mosquito repellent market over the forecast period. The mosquito repellent market report covers comprehensive information about market, volume (Mn units) & volume (Kilo Liter) and value (US$ Mn) projections, market trends, competition, market dynamics and recent developments in the global mosquito repellent market for the study period 2018 to 2026. The global mosquito repellent market is estimated to reach a value of over US$ 10,689.6 Mn by the end of 2026 while registering a CAGR of 8.0% between 2018 and 2026. Increasing use of mosquito repellents as home care products for the prevention of mosquito borne diseases has created a positive growth outlook for the market. Efficient prevention of mosquito borne diseases can be achieved by using various types of mosquito repellents, such as coils, creams, sprays, vaporizers, oils and others. Over the years, the bio-based mosquito repellent segment has gained higher traction in the market as compared to the synthetic mosquito repellent segment. While the retail stores segment holds significant value and volume share in the mosquito repellent market, the online segment is expected to deliver high growth over the years. Specific initiatives aimed towards vector diseases prevention are expected to upsurge the demand for mosquito repellents in various countries. Manufacturers are focusing on developing better and environment-friendly solutions for the prevention of such diseases and are developing advanced mosquito repelling products, such as mosquito repellent roll-ons, wipes, bands and others. PMR uses a modelling-based approach and triangulation methodology, which includes hypothesis generation, data collection, market profiling, pricing analysis, forecast development and competition mapping of market leaders and followers. To estimate the global volume consumption of mosquito repellents, the number of mosquito repellent units manufactured were calculated for coil, cream, mat and other product types. Spray/aerosol, vaporizer and oil volumes have been calculated in terms of Kl (kilo Liter) of mosquito liquid consumed for the manufacturing of mosquito repellent. This was further verified from the supply and demand side wherein mosquito repellent units and mosquito liquid (KL) production capacities of the major players were tracked to analyze the global supply and demand scenario for mosquito repellents. The mosquito repellent pricing analysis has been done from the manufacturing side for product type segments, including coil, cream, vaporizer, spray/aerosols, oil and others. The report on the mosquito repellent market is a syndicated research report, structured on the basis of a predefined scope. The key intent of the report is to highlight the volume sales in terms of both Mn units and Kilo liters for mosquito repellents across key regions. The report comprises numerous market analysis frameworks, such as year-on-year growth, market attractiveness, BPS analysis, analysis and incremental $ opportunity index. These market outlines provide clients with a detailed understanding of the mosquito repellent market, classifying the relatively broad scope of the market and also giving them an idea about the recent trends in the mosquito repellent market. The global market is anticipated to expand at a rate of 8.0 % over the forecast period. Developing economies, such as India, South Africa, Brazil and others, have exhibited more than average growth in terms of demand and consumption of mosquito repellents. Rising demand for mosquito repellents can be attributed to the rising number of vector borne diseases, which has resulted in increasing use of mosquito repellents for diseases prevention. On the basis of product type, synthetic repellents containing DEET are most commonly used mosquito repellents. While DEET is an effective contact mosquito repellent, the oily feel, smell on the skin and skin irritation are some of the primary reasons for the sluggish growth of synthetic repellents. Various advantages associated with plant derived-mosquito repellents or bio-based mosquito repellents, such as fragrance, high skin and vapor action without irritation, will create a positive growth outlook for the market over the forecast period. The Department of Environmental Protection has suggested that natural mosquito repellents (Biobased) are better for human health. Thus, market leaders have already launched various natural mosquito repellents to offer effective protection from mosquitoes. Manufacturers have developed different new advanced products under the mosquito repellents category, such as body sprays, wipes, roll-ons and hand bands. Companies have also launched plug-in mats for instant result and candles and incense that emit natural scents that mosquitoes are averse to. The use of herbal leaves and homemade repellents is still prevalent in rural areas of developing countries. For instance, almost 56% of the Indian market still uses non-branded mosquito repellents. Lack of electricity and presence of low-income households in rural countries are the major factors responsible for the low volume share of creams, vaporizers, sprays and others in the global market. Therefore, companies, such as S.C. Johnson and Sons, 3M and Godrej Consumer Products Limited, are launching more economical products, such as fast cards, hand bands, wipes, roll on and others. According to the World Health Organization, ~80% of the world population is at risk of one or more vector borne diseases. Over 700 000 deaths are caused by vector-borne diseases annually. Owing to the above mentioned facts, health organizations (WHO, UNICEF, and others) are recommending the use of Synthetic (DEET based) and natural mosquito repellents to reduce the risk of mosquito borne diseases. However, the global market also faces various challenges. Emission of harmful smoke from coils and high prices of creams, vaporizers and sprays are some of the important challenges. Thus, research is being done to develop alternative materials for use in the production of mosquito repellents and this is projected to impact the global market during the forecast period. The global mosquito repellent market is a highly consolidated one with major players, such as S.C. Johnson and Sons, 3M, SPECTRUM BRANDS, INC., Avon Products Inc., Reckitt Benckiser Group, Godrej Group, amongst others, holding 50% – 60% share in the global market. Some of the other prominent players covered in this global mosquito repellent market study are Coghlan, Dabur India, Jyothy Laboratories, Omega and others.